Mapping the relative popularity of different politicians is old hat to the Floatingsheep collective -- our map comparing references to Barack Obama and John McCain was one of the first maps ever featured on the site (and the first that Taylor made!). A much more aesthetically advanced version of that map has now published in the Atlas of the 2008 Elections, edited by fellow Kentucky geographer Stan Brunn and a bevy of others. 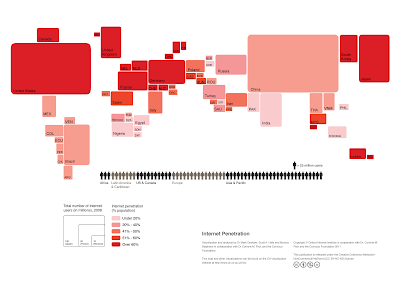 To honor that publication, as well as to acknowledge the ballyhoo these days about the role of digital technologies in promoting social and political change across the globe, more analysis seems timely. 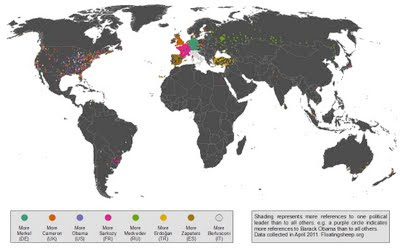 We now broaden the geographic extent of our earlier map and present the following, showing the relative prevalence of references to the names of political leaders in eight major countries in Europe and North America. As is par for the course around here, each color dot represents more references in that location to the name of that politician than to each of the other seven. 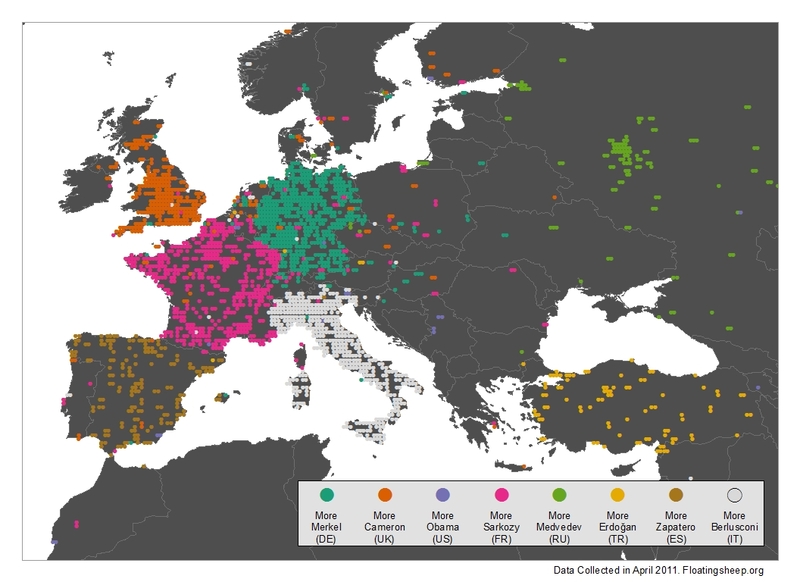 In other words, a purple dot means that there are more references to Barack Obama than to Angela Merkel, David Cameron, etc. It should also be noted that the keywords used for this comparison are the full names of each politician, rather than simply a last name. When focusing on Europe, the map almost perfectly shows that references to the name of a political leader are likely to predominate in the country that politician represents. England is awash in the burnt orange color symbolizing David Cameron, Spain in brown for José Luis Rodríguez Zapatero, France in the pink of Nicolas Sarkozy, the silver of Silvio Berlusconi covering Italy, the blue-green of Angela Merkel filling the borders of Germany, Recep Tayyip Erdoğan's yellow in Turkey and the green of Dmitry Medvedev scattered across Russia, however concentrated in the west. In this sense, the map conveys a relatively simple point that we've been spending quite some time trying to reiterate: the internet, and thus the data within it, is not somehow disconnected from geography. Instead, the two are very much intertwined, with digital representations of place being very much tied to the characteristics of that place, including its politics. Where this map gets interesting, however, is when one looks away from Europe, especially returning to the United States (see the first map above). One may expect a veritable blanket of purple, symbolizing Obama, to cover the country in much the same way as the references to other political leaders did in their home countries. It is instead a potpourri of colors, with each of the other politicians dominating in one place or another. Whether this has to do with Obama's declining popularity or something else, we are unsure. 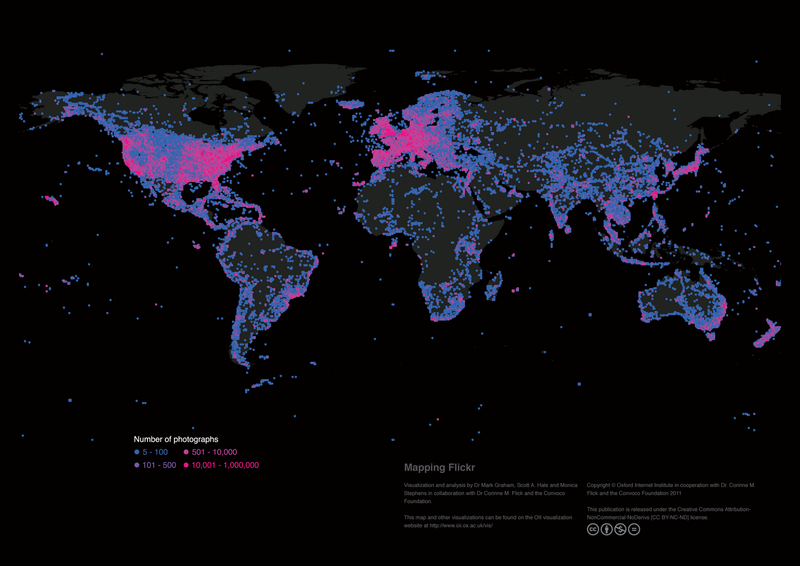 Given that all of the other countries included in this map, with the exception of Russia, are relatively small in terms of area, there may be a negative correlation between the areal extent of the country and the likelihood of complete homogeneity in Google Maps references. It is surprising, however, how much this deviates from Obama's dominance when compared to John McCain in 2008, as reflected in our Presidential Placemark Poll map. Maybe this is just evidence of an evil Obama plot to sell off America's virtual territory to socialist (and not-so-socialist) Europeans? As always, our speculation usually leads us to a dead end, to which we have now arrived. Let the digital jockeying for territorial dominance commence! As part of our ongoing research into the online geographies of mind-altering substances, we present in this post an analysis of caffeinated beverages in China and Taiwan. In these first two maps we compare references to tea and coffee in both Chinese and English. You see that mainland China is almost entirely dominated by references to tea in both languages. Taiwan, in contrast, is mirrored by many more references to coffee in both languages. Somewhat surprising is the fact that there are some small pockets of coffee references on the mainland in English (notably Shanghai and a few in Beijing). Is this an indicator of a move towards more Western types of consumption (i.e. coffee) in Taiwan and Shanghai? Or perhaps it reflects areas of with larger populations of coffee-drinking expatriates? Or -- in a completely unwarrented, speculative and highly alarmist vein -- it could be a sign of an impending trade war (reminiscent of the Opium Wars) in which Caramel Frappuccinos are used to balance the western (largely American) trade deficit. What we see here is that while there is unsurprisingly more Chinese content referencing both tea and coffee in most parts of the region, there are interestingly more references to tea in English in large parts of rural China. Many of these blue blotches of English-language references are actually layered over tea plantations in the south of the country. It is possible though that the English-language references to tea tells us more about Internet content in China than hot green or black beverages. 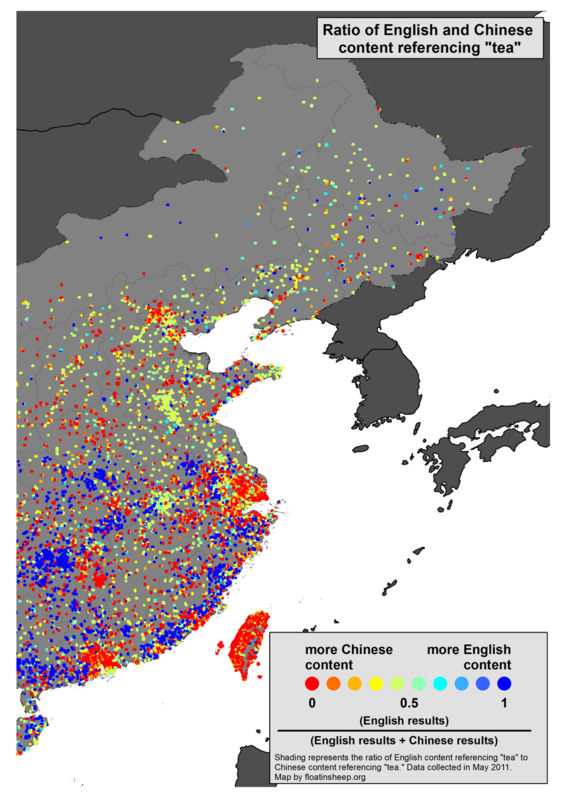 In almost all of the cases in which there is more English-language content, it is because the English word ("tea") receives only one hit while the Chinese word ("茶") receives none. So, the explanation for these differences could simply be that Google has just not got around to indexing local content throughout much of rural China. In any case, next time you hear some use the phrase, "not for all the tea in China" point them to these maps so they have a better sense of what they're giving up. Thanks to Han-Teng Liao for the help with this post. 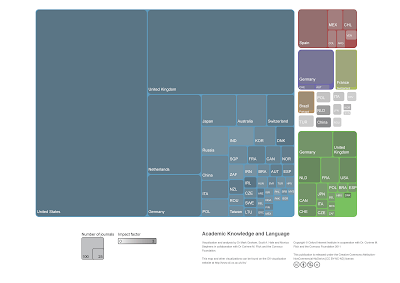 Graham, M., Hale, S. A. and Stephens, M. (2011) Geographies of the World's Knowledge. London, Convoco! Edition. One of the Floatinsheep collective (Mark) is now accepting applications for a part-time Research Assistant to work on a new project to be based in Oxford: Using the Social Web to Map and Measure Online Cultural Diffusion. Map interpolation is kind of like eating potato chips, once you start it is hard to stop. So today we offer a closer look at pot pricing in the Northeastern United States but be warned, there is actually intellectual content ahead as well. Also, with tongue firmly in cheek, we thought that the identification of less expensive marijuana could be our contribution to those hardest hit by Hurricane Irene, including Monica's home state of Vermont. For example, the strip of low prices to the East of Syracuse in upstate New York is sparsely populated and contains very few price reports. Using only the cities where 10 or more people uploaded price reports results in the interpolated map below (also using kriging based the 12-nearest points). 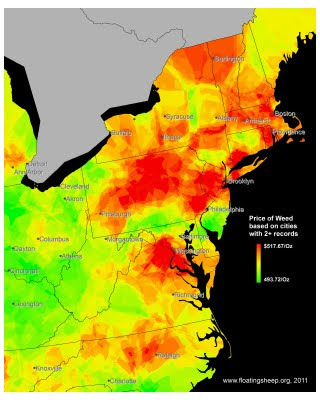 This provides a more smooth surface for the variance in prices as price as there are fewer points and the prices between cities are estimated. 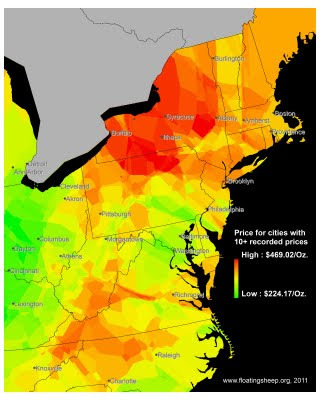 In this map the low price region east of Syracuse, NY drops out....But interestingly other patterns in the previous interpolation such as the lower prices in central south Pennsylvania around Harrisburg remain. Moreover the lower prices west of the Appalachian mountains is consistent across both maps.